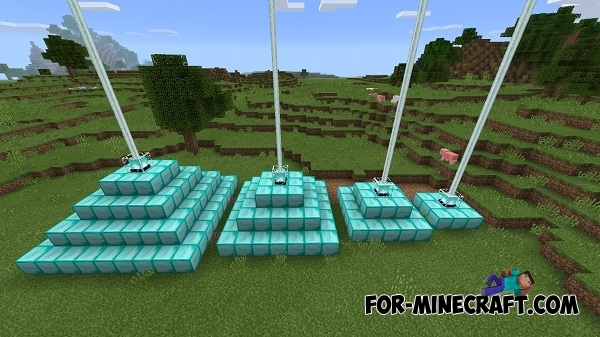 Beacon PE adds fully working beacon which can give the players a variety of effects in a small radius. Mod is made a qualitatively, it is worth noting a pleasant beacon menu interface. First you need to get it. Beacon is available in the inventory of the creative mode, but you can also crafting it (crafting recipe below) or obtained by using ToolBox addon. Now you need to make the construction for beacon. It can be made of different blocks (emerald, iron, gold and diamond). And you can make this construction in different sizes (screenshot below). It is noteworthy that depending on the block will be available to certain effects. All effects are available for the diamond structure. I made a diamond construction and has placed the beacon on the top. Now you need to open the beacon menu. To do this, simply tap on the him. As you can see, the interface is made very nice and understandable for many. There is a basic effect and an additional (health regeneration), which will apply in any case. To get the effect you need to select the main effect, put one of the resources (emerald, diamond, gold or iron) in the slot, and then click the confirm button. As long as you is located at a certain distance from the beam, the effect will last indefinitely. This radius depends on the height of the pyramid. For single-stage - 16 blocks, further - 24, 32 blocks, and four-stage - 50 blocks.